What is the Philippines Climate like? In The Philippines the period from March to May is hot and dry. June to October is the "Rainy Season". November to February is relatively cool. Average temperatures: 78°F / 25°C to 90°F / 32°C; humidity is 77%. What Languages are Spoken in the Philippines? 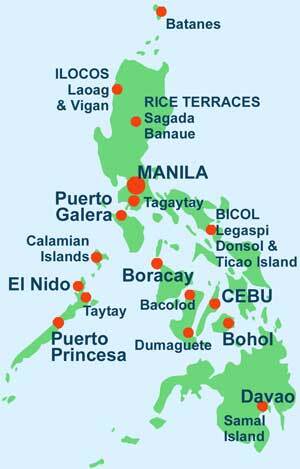 The Philippines has two official languages - Filipino and English. Filipino, based on Tagalog, is the national language. English is also widely spoken and is used in higher education and business. Most signage is in English. What are the Religions of the Philippines? Some 83% of Filipinos are Catholic, and around 5% are Moslem. The rest are made up of smaller Christian denominations and Buddhist. What Units of Measurement are recognised in the Philippines? The Metric System is used in most trade and legal transactions. 220 volts a/c is the common standard. 110 volts a/c is also used, especially in major hotels. The Philippines' monetary unit is the peso, divided into 100 centavos. Common currencies exchanged are AU$, US$, and GB £s. You can change money at the airport on arrival. Foreign currency may also be exchanged at many hotels, most large department stores, banks, and authorised money changing shops accredited by the Central Bank of the Philippines. Please note that some money changers, such as at the airport, do not buy Philippine Pesos back. International credit cards such as Visa, Diners Club, Bank Americard, Master Card, and American Express are accepted in most hotels and major establishments, as well as many restaurants. ATMs are widespread in most large cities and towns, but not so in some isolated and rural communities. Be sure to carry enough cash when travelling to out of the way destinations. Cashpoint machines at BPI (Bank of Philippine Islands) and Metrobank accept debit and credit cards readily. Let your guide know if you need a cash machine. They will know the locations and stop for you. Be sure to let your card holders know you will be using your cards abroad, so they don't get blocked. You should carry some Philippine Pesos with you to purchase small items at bars and shops. Where can I search and book Philippines hotels? The Philippines seems to have a reputation for natural phenomina like Volcanoes, Typhoons, and maybe some occasional political chaos! However, the sensible traveller will find a very welcoming country. Filipinos are a hospitable people, and it's easy to enjoy their country's charms. Like many parts of Asia The Philippines is safe provided sensible precautions are taken - you don't flash cash or jewellery about, and use booked transport and taxis when travelling. It is generally advised that the south west of Mindanao - the Sulu archipelago including Basilan, Tawi-Tawi and Jolo, be avoided, where there are ongoing military and police operations against insurgent groups. Useful Travel Advice and Links can be obtained from local Government Websites.